The Creek Course at Indian Creek features 4 sets of tees that play to distances and slopes measuring 7000 yards/129 slope,6532 yards/125 slope, 5954 yards/115 slope and 5271 yards with a slope of 119 for women hitting from the forward sets. As these slopes indicate, this is a player friendly design. The terrain is fairly level and tree lined, but there is generally ample room off the tees and on the approaches. There are a total of 55 soft sand bunkers located near the landing zones or greenside and water is a pronounced feature as hazards come into play in some shape or form on 15 holes. The green complexes are slightly raised with mounding and gentle swales, but ample room is provided for up and down recoveries. The bent grass putting surfaces are large in size and mild in undulation. Indian Creek presents two distinctive layouts, a comprehensive practice facility, full service clubhouse, and friendly service. 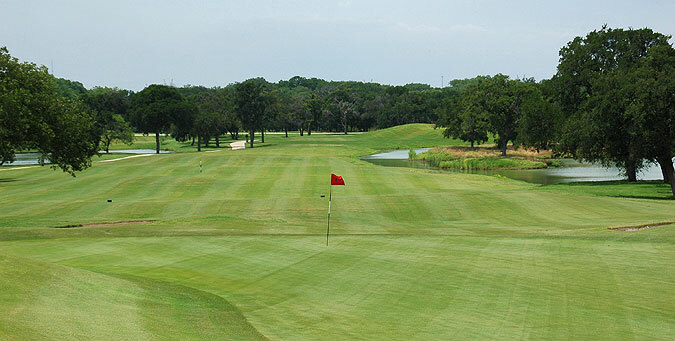 The rate structure makes this one of the regions best golf values. For more info, visit our page for the Lake Course, with direct link to their website by clicking here.